The Toronto Raptors will select 23rd in the 2017 NBA Draft on Thursday night. It's easy to say that DeMar DeRozan's selection at ninth overall in the 2009 Draft is the moment that sticks out most in Toronto's recent draft history, but there have been plenty of enjoyable moments along the way to the team the Raptors have assembled. Player moment is part of professional sports. Still, each of the players drafted by the Raptors — including those who are no longer with the team — are a piece of the puzzle leading to the roster the team has built today. 1 - With the ninth pick in the 2009 draft, the Raptors selected DeMar DeRozan out of USC. A freshman, DeRozan was considered one of the prospects with the highest upside in his draft class. Eight years later, DeRozan is the longest-tenured player on Toronto's roster, spending much of this past season breaking franchise records and getting his name to the top of the record books. Toronto here I come. Air Canadas back. I feel like I already been with Toronto forrever thanks to the Rapters fans. I love y'all. 2 - In 2010, the Raptors found themselves on the clock with a prospect available that they had expected to be off the draft boards. Despite not coming to Toronto for a pre-draft workout, Toronto selected Ed Davis with the 13th overall pick. When he was drafted Davis didn't have a passport. 4 - The Raptors drafted two players in the 2012 draft: Terrence Ross with the eighth overall pick, and Quincy Acy with the 37th overall pick. Ross, drafted out of Washington, was selected higher in the lottery than many had projected. He spent his first four-and-a-half seasons with Toronto being being traded to Orlando earlier this season in exchange for Serge Ibaka. Acy, a four-year senior from Baylor, spent just a season and a half with the Raptors before being sent to the Kings in a three-team trade that brought Rudy Gay to the Raptors, but made a mark with his hustle and passion. The duo joined Jonas Valanciunas to as a rookie trio in the 2012-13 season. 6 - The 2015 Draft was a win for seniors. In the first round, Toronto selected Delon Wright, a senior point guard out of Utah. After a draft night trade that sent Greivis Vasquez to the Milwaukee Bucks, the Bucks selected four-year senior Norman Powell out of UCLA with the 46th pick for Toronto. Dorell's former teammate, Dwyane Wade tweeted and posted a photo of Delon from draft night and Gabrielle Union tweeted shortly before he was picked. @dwrightuno Lil bro jus got drafted. Wow!!! Congrats to DeLon Wright going 20th pick to Toronto Raptors..
7 - In 2016, Toronto drafted a pair of rookies with both upside and the ability to contribute almost immediately. 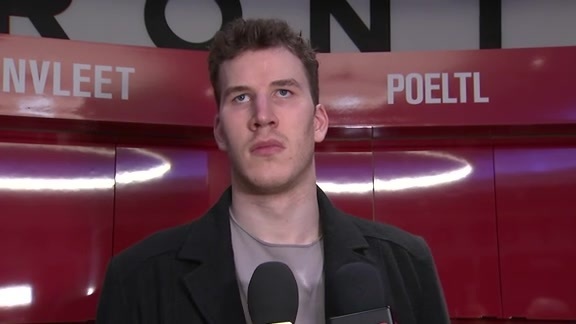 With their lottery pick, the team selected Jakob Poeltl ninth overall, making him the first Austrian player to be selected in the draft. Poeltl was drafted out of Utah, where he was a sophomore, and had played with Wright before the team selected Wright a year earlier. Siakam opened the season starting for the Raptors after Jared Sullinger underwent offseason surgery before eventually moving back to the bench. Both he and Poeltl worked their way into the rotation at various times of the season, a testament to both their work ethic and coach ability. With the 20th pick in this year's draft, what the Raptors do will be largely dependent upon what happens before it's their time to pick Masai Ujiri spoke with Toronto media on Tuesday morning, saying that the team will concentrate on finding the best possible player available at 23 when the Raptors make their selection. The most exciting part of draft night is that no one knows who that will be until the team is on the clock.